"Austin's family and I, we all get along really well. I think because I've know them for 15 years, I'm super comfortable with them." Dinner with the Forsyths is very different than dinner with the Duggars, as "Mr. Terry and Miss Roxanne," as Joy calls them, have 17 less children than Jim Bob and Michelle Duggar. (Austin has one older sister.) In the scene below, Joy helps her future mother-in-law and sister-in-law make dinner for the family and even tries her hand at a secret family recipe. Beat softened slightly warmed cream cheese. Add icing sugar and beat for 1 minute on high. In separate bowl, mix Dream Whip and milk, and beat for 2 minutes at high speed. Blend into cream cheese mix. Pour into graham crust, and spoon 3/4 can of cherry pie filling on top. Cover with lid of graham crust, and refrigerate 2 hours before serving. Will firm up on refrigeration. The steaks on the grill make me hungry! The cheesecake recipe can probably be found on the Philadelphia Cream Cheese website They have a plethora of recipes usng their product. Every family puts their own twist on favorite recipes, but I don't think that the cheesecake was from a secret family recipe. Comfortable enough to poke your future father-in-law in the stomach, in a rare show of physical contact from the family that side hugs only. How did that strange looking yellow mess in the mixing bowl end up going into the oven looking like something from an ad for Philly cream cheese? I think there was some kitchen magic edited out. I would have enjoyed seeing more footage of her time with the Forsyths, but his parents seemed sweet. I love this episode. I like Joy and I'm very happy for her. So amazed and impressed that Joy was allowed to drive to the Forsyth home alone! 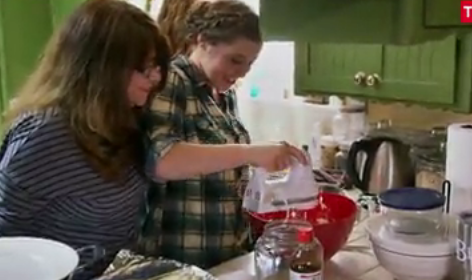 How sweet, inviting over your son's girlfriend to cook for the family. What a lovely invitation. As my mother used to say: "Tie that hair back when in the kitchen". How could Mrs. Forsyth see anything with that mop of hair in her eyes and hanging all over? Just awful. I was confused as to why Joy was allowed to have dinner with Austin's family without bringing a chaperone? When Jessa and Ben were courting, she went to his house to have dinner with him and his sisters and brought Jinger as a chaperone. I know that each couple sets their own standards for their relationship but I was under the impression that having a chaperone present was a non-negotiable rule. Is that incorrect? Joy, your hair looks amazing! Keep wearing it up.